Glory be to you, Osiris the great god within Abydos, king of eternity and lord of everlastingness, the god who passes through millions of years in your existence. You are the eldest son of the womb of Nut, you were engendered by Geb, the ancestor of the gods, you are the lord of the crowns of the north and the south, and of the lofty white crown. As prince of the gods and of men, you have received the crook and the whip and the dignity of your divine fathers. Let your heart which is in the mountain of [the underworld] be content, for your son Horus is established upon your throne. You are crowned the lord of Mendes and ruler in Abydos. Through you the world waxes green in triumph. 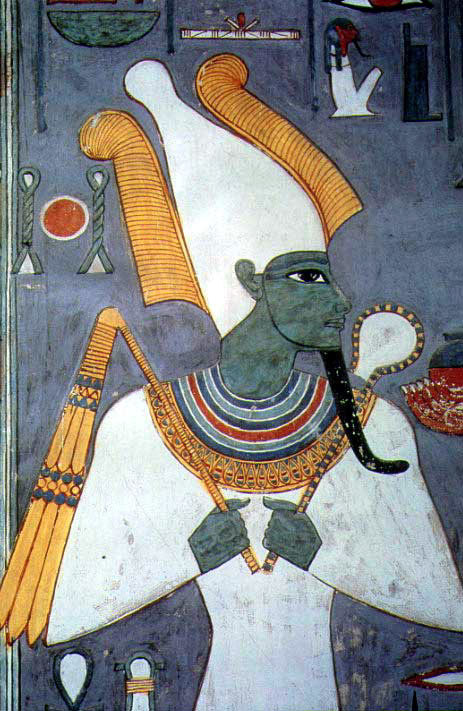 Osiris God is perhaps the most easily recognized of the gods. He was always dressed in white mummy’s clothes; he wore a beard and held in his crossed arms the crook, the flail (whip), and sometimes the scepter-all signs of authority and power. Most often he was depicted as the judge of the dead person’s soul. He was shown either standing on the platform throne of Maat (depicted as a shallow rectangle) or seated upon a throne floating on water out of which sprouted lotus flowers. On his head Osiris God wore either the white crown of Lower Egypt or the atef crown, which was a combination of the white crown and two white plumes. The color of his skin helps to identify his qualities: sometimes it was painted white like a mummy, sometimes black to suggest death, and at times green to symbolize vegetation and resurrection. Some scholars believe that Osiris God may have been an actual human ruler early in civilization, but it is fairly certain that in prehistoric times Osiris God became a minor fertility god associated with Anedjti, the chief god of the Delta village of Busiris. From Anedjti he took the crook and flail as symbols of power. In this! Form he apparently had the character of a dangerous god, and! Some suggestions of this trait the crook and flail, for example- survived into later times. Sometime before the historic period j began and Lower and Upper Egypt were united into one country,] his image was transformed into that of a kind ruler who acted as! Guide to the underworld. His fame spread from the Delta into j Upper Egypt and eventually Abydos became the center of his worship, although he was respected and worshipped throughout the country. According to the myths, Osiris God had become very successful as a ruler and leader on earth, teaching human beings to give up bar1baric practices and to learn to grow grain. His brother Seth grew jealous and killed him by sealing his body in a casket and throwing it into the Nile. Isis,Osiris God ’ wife and sister, sought the body of her husband, but even after she found it, Seth continued to plague her. This time he cut the body into pieces and threw each piece into the river. Isis faithfully began the long search for the pieces. When she found them, Thoth and Anubis wrapped them in mummy’s clothes and restored his shape; Osiris God then became the god of the underworld. In the meantime, Horus, the son of Osiris God and Isis, had grown to maturity and sworn to seek revenge for his father’s death and mutilation. He sought out Seth and they fought the epic battle of Egyptian mythology. Horus eventually won and the rest of the gods made peace. As god of the underworld, Osiris God became respected above all other Egyptian gods. He was responsible for receiving reports from other gods of the recently dead person’s soul as it progressed through the trials of the underworld, and for rendering final judgment on the fate of the soul. 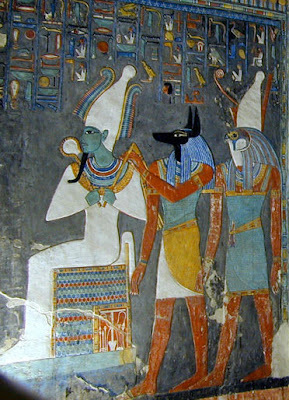 He was usually attended by Isis and Nephthys and assisted by Thoth and Horus, who spent only part of their time in the underworld; having earthly responsibilities as well the jackal-headed god Anubis was responsible for embalming and generally preparing the body and, as such, was Osiris God ’ chief assistant. Before the recent building of the High Dam at Aswan, the waters of the Nile annually flooded the entire river valley. By June the land had dried out and the people had begun to worry about the next flood: when would it come? Would it bring enough water this year? Then about mid-July the water would begin to rise, irrigating the low-lying areas near the river bed. In early fall, if all went well, the flood reached its peak, inundating the gardens of the farmers. By winter the receding waters had left a layer of silt, rich in minerals that fertilized the soil for the coming season’s crops. In spring the crops would be growing, ready for harvest just before the dry season in early summer when the cycle began again. Osiris God became identified with the river and the growing crops. He had earlier been viewed as a fertility god, but later he was naturally associated with the river that had been his deathbed on two occasions. He became a vegetation god, symbolic of the river’s life-giving force and the annual renewal of crops. He was especially connected with the grains that nourished the gods of Heliopolis as well as the people of earth; when turned into liquid form, the grains became beer that was sacred to the gods and joy- giving to human beings. Many festivals were held in his honor, since his worship extended from the Delta to the first cataract in the south; a Graeco-Roman text on the walls of the temple at Dendera described an ancient ritual performed annually in Osiris God ’ honor as early as the Middle Kingdom. At the time when the flood was at its height, the Feast of Khoiak began with the celebration of an effigy of the dead god, cast in gold and filled with a mixture of sand and grain. As the waters were receding and grain was being Planted in the land, the effigy was watered daily. Then for three days it was floated on the waters of the Nile, and on the twenty-fourth day of the month of Khoiak it was placed in a coffin and laid in a grave. On the thirtieth day, the effigy was actually buried. This seven-day delay represented the god’s seven-day gestation in the womb of Nut, his mother. On the last day, the king and priests raised a djed pillar a phallic symbol of the rejuvenation and strength of Osiris God as a sign that he had been born again and that the land would be fertile for yet another year. Since Osiris God was the god of the underworld, he was not worshipped in the same sense as were the sun gods, but numerous temples were built in his honor. His chief cult sites were Abydos, with its remarkable temples built by Seti I and his son Ramesses II; Dendera, with the text of the ritual mentioned above; and Philae, where Osiris was revered in the Temple of Isis. Many of the tombs and temples of Upper Egypt contain depictions of Osiris as the god of the underworld and as the god of renewed life. A large number of statues of Osiris from these sites have found their way into museums around the world. Much of what we know about Osiris, however, comes in textual form. The Pyramid Texts, the Coffin Texts, and the Book of the Dead contain the basis of our knowledge about Osiris’ role in the treatment of the dead. The Book of the Dead’s vignettes provide us with drawings of the god that are especially vivid (and often reproduced). The basic myth of the murder of Osiris and the search for his body, as well as the war between Seth and Horus, is told in Plutarch’s essay “Isis and Osiris" date from the first century after Christ.